Here are some things you might not have considered. Secure the objects in your car: this might seem silly but you'd be surprised how many accidents per year occur simply because someone was either reaching for an item they shouldn't have been and the object struck the driver because it wasn't properly secured and they had to stop suddenly. Don't crack the windows: as much as this might be a habit for some people to keep their car cool this gives a would be thief easy access to break your window and steal your belongings. You might argue they would break your window regardless of whether it was cracked or not, but why give someone anymore incentive? Put your valuables in the trunk: Simply put, if you don't need it, stow it away. You are less likely to be robbed of your valuables if thieves can't see them. Approach flashing hazard lights with caution: This should be common sense but you'd be surprised how many accidents occur when someone tries to speed around someone with their hazard lights on, especially if they're in the road. Take down the window objects: that cute little bear with the suction cup may look nice in your passenger’s window, but it's blocking your view of what's going on around you, even if it's just a little bit,. Adjust for conditions: Again, this might seem obvious, but we can't tell you how many times accidents could have been avoided had people made sure their cars had the appropriate amount of fluids, fuel, and equipment to see them through their journey. For example, if it's raining, make sure your windshield wipers are up to date and that you have plenty of washer fluid. 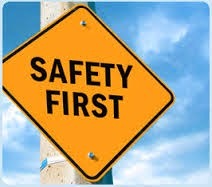 Above all be safe. Apply proper automotive preparation for weather and road conditions. Use courtesy and caution when driving. Use common and uncommon sense when it comes to car safety and you'll be better prepared than most on the road. If you're looking to improve the safety of your new or used vehicle, turn to the experts at Olympia Automall. The largest selection of new and used cars in the Puyallup and Olympia area.